Expires 1 year after purchase. Limit 2 per person, may buy 2 additional as gifts. Booking required by phone, contact 055-2571530 or 055-8644667. Prior booking (subject to availability) at least 48 hours in advance, cancellation 24 hours in advance. The following fee must be paid directly to the moving company to get the full service: AED 600, AED 800, AED 1200, AED 2000, AED 2800, AED 3600, AED 4400; options 1-6 respectively. Valid only for Abu Dhabi and Dubai. Surcharge for boxes; disassembly and reassembly of wardrobes and large TV units; drilling, mounting and curtain hanging services; moving pets and playground toys; moving between two cities. 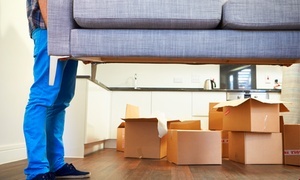 Any furniture damage or loss will be on the movers' responsibility. Valid only for option purchased. Printed voucher must be presented. Groupon prices are inclusive of VAT where applicable. See the rules that apply to all deals.